Yiju Huang’s Tapestry of Light aims to trace the aftermath of the Cultural Revolution (1966-1976; hereafter also referred to as CR) in literary, cinematic, and artistic works, exploring how the effects of trauma can influence aesthetics and how this in turn influences perceptions of the past, present, and future of China. In the introduction, Huang establishes her view of the Cultural Revolution as a “catastrophe.” and that “public consciousness and understanding of the Cultural Revolution have yet to be adequately fostered” (p. 1). She further criticizes the lack of systematic reflection on the “psychological, moral, and social aftermath” of the CR, as well as the continued propensity of leftist scholars to express “enthusiasm” for this period of Chinese history. When discussing the latter, Huang singles out French philosopher Alain Badiou, who has written nostalgically of the Cultural Revolution, as well as Liu Kang’s criticism of Slavoj Žižek’s (mis-) readings of China and the Mao period. Huang laments the “glaring divide” that has, in her view, developed between scholars in the forty years following the end of the Cultural Revolution: On the one hand, the perception of the event as a “monster,” something that “left a muted and violent legacy”; and, on the other hand, the idea of the Cultural Revolution as a “messianic ‘truth-event’.” Huang makes no secret of her own position, declaring that her book “takes as its point of departure that the Cultural Revolution was a catastrophe,” and that her intention is to address the catastrophic nature of the event in structural terms. Huang defines aesthetic afterlives as works of art “created in the aftermath of the Cultural Revolution that have aesthetic, ethical, political, psychological, or metaphysical significance” (p. 8). She refutes the official interpretation offered by the CCP of “ten years of chaos” (十年动乱), attributed solely to the Gang of Four, and the consequent settling of the issue with its imprisonment. This allowed, Huang argues, for the past to be quickly forgotten, replaced by the ideology of “looking forward” (朝前看). Deng Xiaoping’s 1979 talk at the Fourth Congress of Chinese Writers and Artists instructed his audience to “look forward” in an effort to avoid “melancholic dwelling on the traumatic past” (p. 9). Contra the official verdict, Huang’s ambition is to view the Cultural Revolution as “an open wound in time,” an ongoing and unresolved trauma rather than damage done in an historical past. This critique of the practice of disavowing or overlooking the continuing traumatic aftermath of the Cultural Revolution is an integral feature of the book. True to her title, Tapestry of Light (taken from a line in Vera Schwarcz’s poem “Gems” (collected in Schwarcz’s Chisel of Remembrance,) Huang aims to weave a more multifarious picture of the Cultural Revolution by looking at different genres of literary and artistic expression. Chapter 2 focuses on Hong Ying’s 1998 novel Daughter of the River (飢餓的女兒), about a young woman born in the last year of the famine brought on by the Great Leap Forward (1958-1961). According to Huang, the “continuing official reticence on the Great Famine” has perpetuated a “prevailing sense of secrecy” around the issue, and the trauma it created. This silence, she writes, has “relegated the collective experience of hunger to the background of public consciousness” (p. 19). She raises the issue of the relative scarcity of stories depicting this catastrophic event despite its severity and number of victims. Huang’s analysis of the book takes as its point of departure the psychological impact of the famine and, especially, its legacy. By investigating the continuing effects of the famine on the narrator’s family and her native city of Chongqing, Huang examines how the secrecy and unresolved trauma surrounding the catastrophe of the Great Leap Forward creates a nightmarish existence in an emotional wasteland. The focus of this chapter is not so much the aesthetic afterlives of the Cultural Revolution as those of the Great Leap Forward and the resulting famine. TheGreat Leap Forward, Huang explains, “set the stage” for the Cultural Revolution, which in turn constituted “Mao’s reaction to the failure of this transformation attempt” (p. 17). While the connection between the two events is hardly far fetched, the dedication of such a substantial part of the book to what is ostensibly the “aesthetic afterlives of the Great Leap Forward” could perhaps have benefited from a clearer link to focus indicated by the book’s title. Huang also addresses a “crucial point misinterpreted by many” in the works of Han: the reading of Pa Pa Pa as an allegory of the backwardness of Chinese culture, à la May Fourth fiction. Rather than a critique of traditional society from a modern point of view, the text should, according to her, be read as a commentary on modernity itself, intentionally highlighting “its internal illogic, contradiction, and fissure by means of relapse into a mythic time, imaginative realms, and the opaqueness of otherness” (p. 63). The red line then becomes a “literary phantom” (ibid) of the bloodline theory, and the terror that it caused. This trauma, in line with Huang’s theory of the aftermath of the Great Leap Forward, is unresolved, shrouded in secrecy, and thereby left to fester in the collective unconscious. The fifth chapter moves on to yet another art form: cinema. Huang offers close readings of Jiang Wen’s In the Heat of the Sun (陽光燦爛的日子, 1994), and Ann Hui’s The Postmodern Life of My Aunt (姨媽的後現代生活, 2006). A focal point is the concept of youth in relation to the Cultural Revolution and its legacy; Huang states that her intention is to move beyond the “double faces of youth”—images of Mao’s children, first as Red Guards, then as the “lost generation,” who were sent down to the countryside for reeducation. Huang’s readings emphasize how these films contest this oversimplification of the realities of growing up during the Cultural Revolution, attempting an “alternative poetics of youth characterized by pluralism, malleability, self-interest, and indeterminacy” (p. 102). The chapter boils down to a conclusion regarding the symbolic use of the imagery of the sun and moon in the two films, the sun of course referencing Mao Zedong whereas the moon, bright in Jiang Wen’s film and surreal in Ann Hui’s, functioning to “counter the sun’s blinding absolutism” (p. 128). Through a focus on different genres and on the different ways a traumatic event and its aftermath can have lasting effects on literature and art, the book can be said to accomplish what its author sets out to do in the introduction: to “illuminate a certain vision of the Cultural Revolution” through the selection and construction of a “constellation of texts” (p. 13). All in all, Tapestry of Light offers an intriguing take on how the aftermath of the Cultural Revolution, and the silence/secrecy surrounding some of its horrors, can continue to shape the aesthetics of literature, art, and cinema. When it comes to the understanding of “trauma” and the analysis of traumatic experiences as portrayed in these works, Huang repeatedly falls back on a Freudian reading, and it would have been interesting to see a more in-depth explanation for her methodological choices. Such a critique can extend beyond her definition of trauma: in Huang’s reading of Daughter of the River, Freud’s theory of melancholia is referenced vis-a-vis the imagery of restless spirits, and connected to Chinese ghost lore (p. 26); Han Shaogong’s “indebtedness to Freud” is mentioned with regards to the language of the unconscious (p. 53); and the reading of Zhang Xiaogang’s “Bloodlines” is largely based on Freudian theories of repressed memories (p. 78, 92, 96). These are intriguing readings, but they could have benefited from a clearer and detailed justification of such a heavy reliance on Freud, and perhaps a more critical view of these definitions. 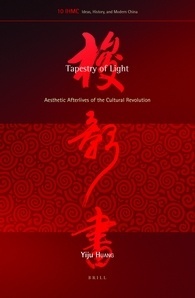 Additionally, and unfortunately, Tapestry of Light suffers from a significant number of typos and errors, as well as missing footnotes and references that undermine and disrupt the reading experience and, consequently, the force of Huang’s arguments. This includes grammatical errors, misspelled names (Ba Jin becomes “Ba Jing” [p. 134], Yan Wenjing becomes “Yan Wenjin” [p. 61], etc. ), and the mistaken crediting of Ban Wang’s The Sublime Figure of History to David Wang (p. 146); as well as omissions (notably Michael Berry’s book, A History of Pain: Trauma in Modern Chinese Literature and Film, that is neither cited nor listed in the bibliography). Despite these shortcomings, Huang’s intention to dislodge the rhetoric of “healing” when addressing the Cultural Revolution—e.g. scar literature and the encouragement to “look forward”—constitutes an interesting and valuable intervention, laying the foundation for a timely and much needed discussion of the past, trauma, and artistic expression in the continuing aftermath of that period of history.